We have surfed, explored and honeymooned our way around the world over the last six and a half months and we are stoked to be ending our epic adventure in Tahiti. 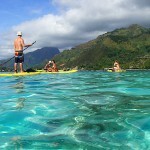 Through a combination of tips from friends and online research we chose to spend our time at a left handed point break called Haapiti on the island of Moorea. 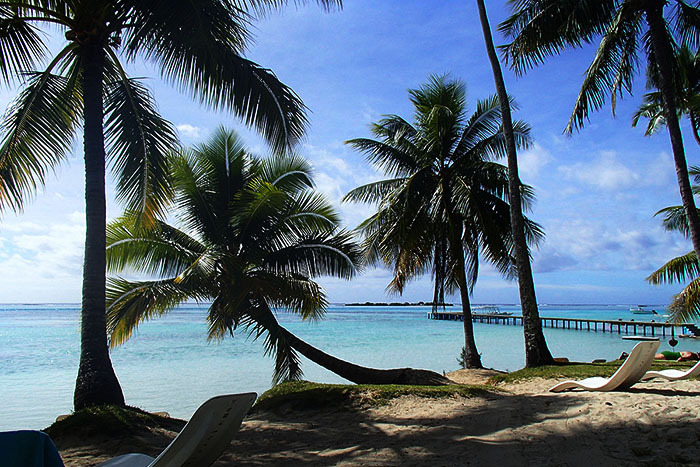 When researching places to stay and things to do we started to get a little worried about completely blowing our budgets because Tahiti caters mostly to those with very large budgets. 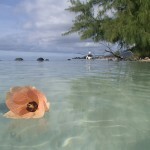 Going back and forth between Trip Advisor and Booking we discovered a little known gem of a place to stay called Moorea Bed and Breakfast which was well priced and close to the surf so we booked for our entire time in Tahiti. Our days usually started with getting up at 6am when it was just starting to get light and heading out for a surf. 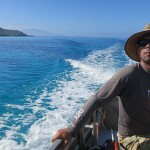 The wave at Haapiti is a long way out on the outer reef so Tama took us out on his boat for a cost of about $30/pp. They also had outrigger canoes and kayaks that were available to borrow for free, but the boat was a nice treat that we had worked into our budget. When watching the break from the shore it doesn’t look that big, but as you get closer to the channel where it breaks you quickly see that it has some serious size. On our first day Josi had brought her board out on the boat hoping to be able to surf as well, but after watching for only a few minutes and seeing an occasional set rolling through at double overhead pitching hollow over the shallow reef we quickly realized that she was not going to be able to surf that day. Luckily for me she had also brought the camera and to my surprise she actually enjoyed taking photos. 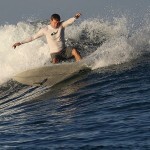 When it’s working, Haapiti is one of the most fun waves I have ever surfed. Even though I got pitched over the falls on several occasions, the drop in is relatively easy and once you are in, the wave builds in size as it hits the shallow reef making it loads of fun. While it does barrel, it also breaks slow enough that you can race ahead of it with lots of time to make big cutbacks which I find rare for a reef break. There were a few days where it was big enough that guys were breaking boards and leashes, but it was never so big that I felt like I was out of my league. One of the things that really surprised me was how friendly the locals were. On one particularly good and busy Saturday all of the locals in the water smiled, and a few even came up and shook my hand which is something that I have never experienced anywhere else. There was one day when Tama had to park his boat way on the inside of the lagoon because it was breaking too big to anchor in the channel. On my paddle back in I saw a lot of commotion in the water between me and the boat that was about 100 Meters away. 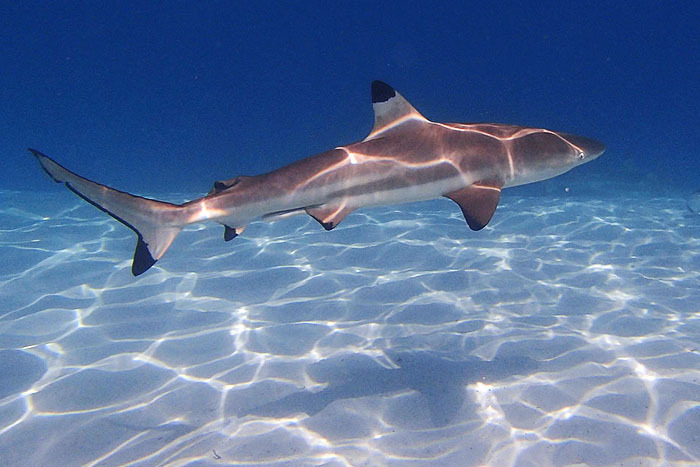 I figured that it was black tip reef sharks which I was told don’t bite so I paddled on. When I got to the boat Josi quickly showed me photos of a small school of sharks that had been feeding exactly where I paddled through. This wasn’t the first time I have surfed with sharks and while sometimes I get really spooked, while surfing in Tahiti I felt pretty at peace with them being there. When the huge swell came we were fortunate to be able to go and check out Teahupoo which was insane. The downside of this big swell was that for 4 days all of the breaks on the island of Moorea were closed out and unsurfable. The upside is that there are so many cool things to do on top of surfing that Josi and I had no problem keeping ourself busy. 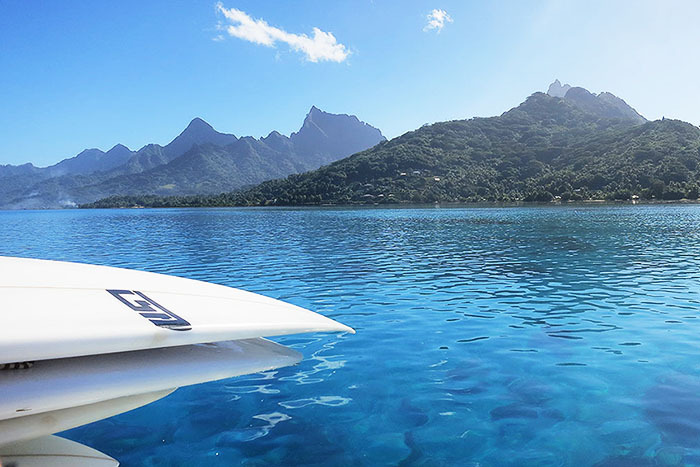 Surfing in Tahiti is like being in a surf magazine with perfect waves breaking over the reef into a bright turquoise lagoon with a backdrop of palm trees and volcanic mountains. The boat drops you off right at the perfect spot and you can paddle out to the surf without even having to duck dive. 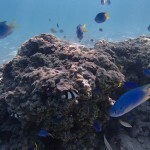 When it breaks the long pealing wave breaks around the reef at first growing in size before levelling off, dropping in size just a little before the inside section jacks up again. When your arms are totally paddled out you make your way back to the boat which is anchored just off of the edge of the wave to grab a drink of water and to return home just in time for breakfast. 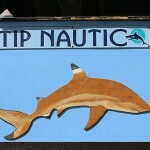 On the short drive home we often saw spinner dolphins, sea turtles and all kinds of fish swimming in the crystal clear water. Tama’s wife Marie greeted us home from the surf with a wonderful breakfast complete with fresh tropical fruits, home made yogurt and jam, pancakes, french breads and coffee. There is no better way to start your day on a beautiful tropical island then with a delicious breakfast. From there we would catch up on emails and then either ride one of the free cruiser bikes, or take a rental scooter, or paddle a kayak to one of the many beautiful beaches near by to go for a swim. 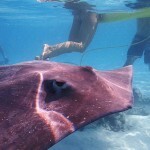 Close by there was one beach where we often swam with huge sting rays and reef sharks that would come right up to you. We made the most of the full kitchen at Moorea Surf B&B by making our own dinners consisting of huge tuna steaks, delicious french cheese and salad. Not only was it way cheeper than eating out, but it was also way tastier. I even managed to put my photography and design skills to use and helped Tama with their website in exchange for staying at their place which worked out perfectly. 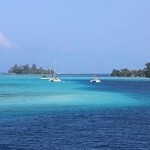 If you are ever going to Tahiti and are looking to stay at a reasonably priced place run by really nice locals who surf, then you have to check out Moorea Bed and Breakfast. I’m not sure when, but at some point in time Josi and I will be coming back for sure! Growing up in Montreal, visiting a French speaking paradise island on the other side of the world was always a childhood dream of mine. 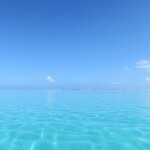 I remember talking about Tahiti with my cousins Judith and Diane when we were growing up, and to us it was sure to be the best place on earth. With these memories in mind, even exhausted I couldn’t contain my excitement as we flew into Tahiti at 2am. I had no idea planes were even allowed to land so late, but in Tahiti they do. For convenience, we booked a room at the Airport Motel right across the street from the airport. It wasn’t cheap, but it was clean and walking distance from our arrival gate. Still riding my high of finally planting my feet in Tahiti, the steep hill up to our hotel became a fun workout rather than a bother. Wanting to get to Moorea as soon as we could, Noel and I lost no time and jumped in a taxi to the ferry terminal first thing the next morning. 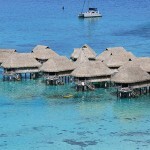 Our taxi ride was only 10 minutes and the fare about $36… a rude awakening to French Polynesian prices. 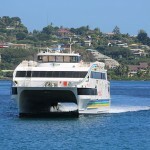 The ferry on the other hand was only $18 each and takes 30 minutes to cross from Tahiti to Moorea. It was beautiful out so we sat outside on the top deck of the boat which provided breathtaking views. 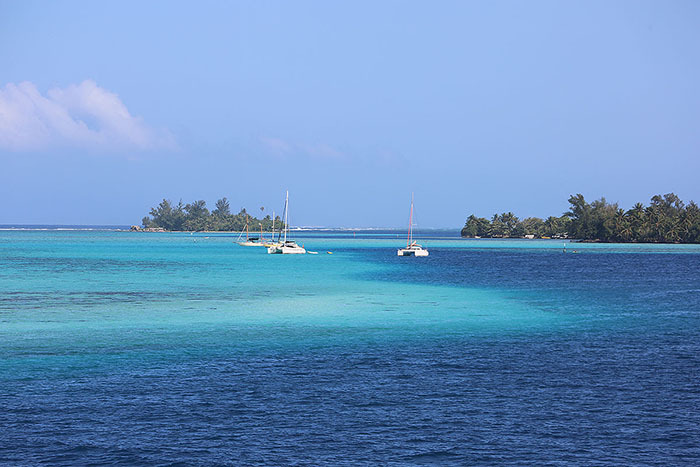 It is absolutely beautiful when you approach the Island of Moorea especially when you get close to the reef which contains this stunning turquoise lagoon. The powerful combination of the lagoon and the steep jungly mountains in the background is hard to describe. 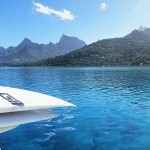 For this last leg of our 6.5 month trip, Noel and I decided to take a break from constantly moving around and chose to book 2 weeks at Moorea Surf B&B, which turned out to be the perfect choice. Our plan was to go into full relaxation mode close by to great surf. I had surfed reef breaks before and I was hoping that Haapiti would be fun and mellow enough that I could surf it. 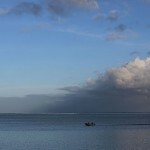 In Moorea the reef where the waves break is pretty far out so having access to a boat is key. 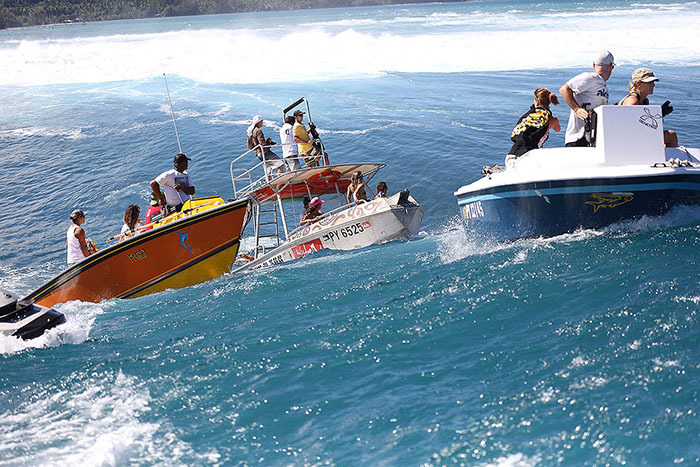 Tama, who owns Moorea Surf B&B with his wife Marie, has a small boat that he uses to take surfers out to the break which worked out perfectly. 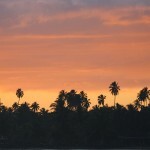 Our first morning, Tama, 2 Brazilian guys, Noel and I woke up early and headed out to the surf minutes before sunrise. 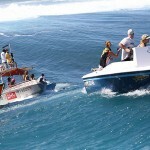 Our boards were all strapped onto the front of the boat and we motored out over the shallow lagoon towards the break. 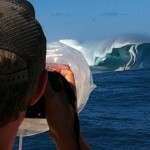 When I saw the size of the wave, I knew that I would be the official photographer for the day. I was pretty bummed that they were so big, but Noel was stoked and I enjoyed taking photos. What was really cool is that we anchored the boat just at the edge of the surf so I was able to have front row seats, perfect for taking photos. The next day was even bigger and the following day the waves were so big that we couldn’t even anchor the boat in the channel. The only day, it got a bit smaller, I gathered my courage and paddled out to see if I could catch a wave. I started by hanging off to the side in the channel where the water is deeper so that if a bigger set would come I wouldn’t get worked. Noel saw me sitting way out where the waves weren’t ever going to break so he pointed for me to come inside a little. For the most part the waves were a pretty decent size that day, but every so often a massive set would roll through. 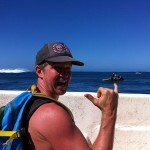 When I finally paddled into the line up, my hands were shaking so much that I knew this wave was not for me. 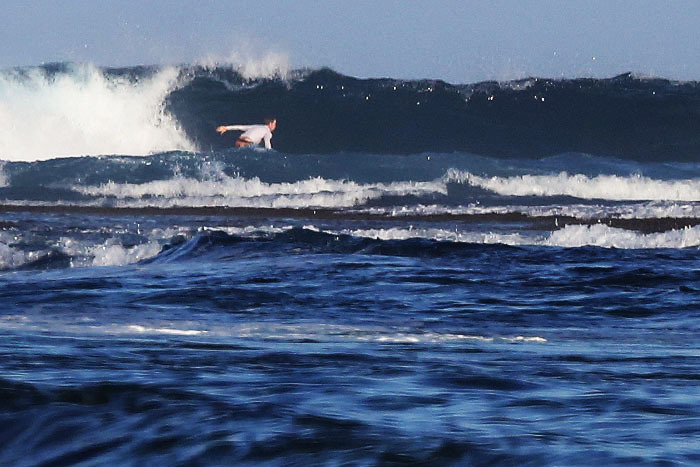 Big, hollow at times, shallow reef, currents, not exactly my idea of a super fun wave. Perhaps next time we come back my skills will be good enough that I can surf it, but not this time. I could definitely have surfed some of the smaller waves coming through, but knowing myself I would have panicked when the big sets rolled in. I was very disappointed as I couldn’t imagine coming to Tahiti and not surf at all, but oh well, that’s how it goes sometimes. Luckily, I discovered a new passion for taking photos and to Noel’s pleasure, he will have a great selection of surf pics to choose from for his next blog. I’m the kind of person who get antsy when I watch other people do stuff because I want to be doing it too, but to my surprise, I kept myself entertained watching the spinner dolphins doing their tricks, swimming by the boat, taking photos and watching the surf. As you saw in our previous post, we also checked out Teahupoo and it’s massive surf which was totally mind blowing and a highlight of this trip for both Noel and I. The adrenaline rush we got from just being on the boat in these conditions was insane. Even the journey to get there was super cool, the 3 of us, Noel and I and our new Swiss friend Christian were so excited driving through a bunch of small towns and so anxious to get a spot on a boat. 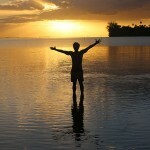 One day on the Island of Tahiti was enough though and I was ready to go back on it’s sister island of Moorea. 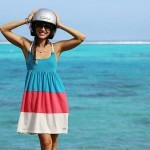 Renting a scooter is definitely a must as there is so much so see and do on the island of Moorea. The roads are in pretty good conditions and the traffic is almost non existent which makes for an easy ride. If you don’t stop, you can go around the whole island in about 1h30, but we took a lot longer because we found ourself stopping several times along the way. 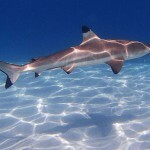 In my opinion, the highlight of our time in Moorea was swimming with the sharks at Tipaniers Beach. 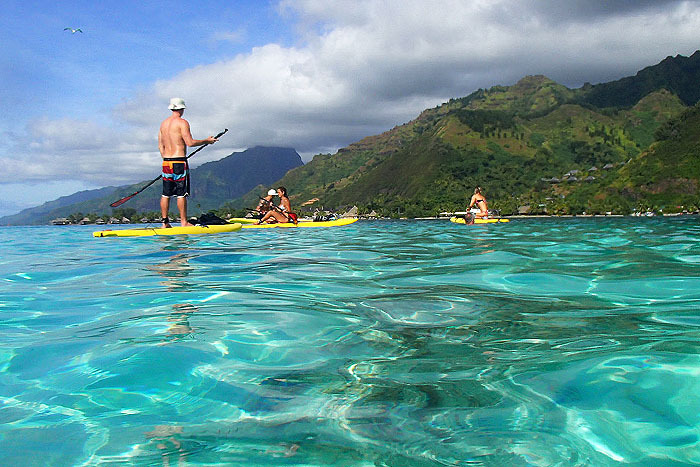 You can rent a paddle board to get to the spot in the lagoon where you can see hundreds of sharks and sting rays. Sometimes when I go surfing, I know in the back of my mind that there could be sharks around, but rather than dwell on it I take the, if I don’t see them, they don’t see me approach. 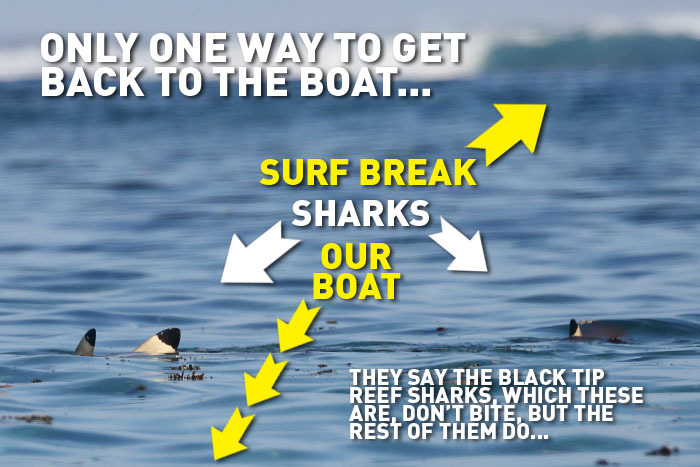 I know that it makes no sense, but I don’t like sharks and it works for me so I’m sticking to it. When our Brazilian friends invited us to join them to go snorkelling with the sharks and rays, I was a bit hesitant. The fact that we would be on paddle boards eased my mind a little because I knew that I was going to be above the water on my personal viewing platform. 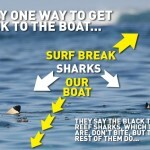 The sharks are only reef sharks, but they are still sharks! Not to mention get pretty big. Once we paddled our way over to where they were I somehow got comfortable enough to swim with them. At one point I was swimming along with about 10 sharks all really close to me which was amazing. On the North side of the Island we did a great drive up into the mountains to a spot called Le Belvedere where you get a panoramic view of Cook’s Bay and Opunohu Bay. Along the way there are old ruins of where they used to sacrifice people just like in the movies. The absolute best was to hang out with my amazing husband at Temae Beach which is the most stunning beach on the island. It’s beautiful and post card perfect! It’s exactly how I pictured things would be if I were to go on the best honeymoon ever. On our last day the only thing I wanted to do was to go back and lay in the sand and to swim in it’s aqua blue waters so that my last memories would be exactly that. 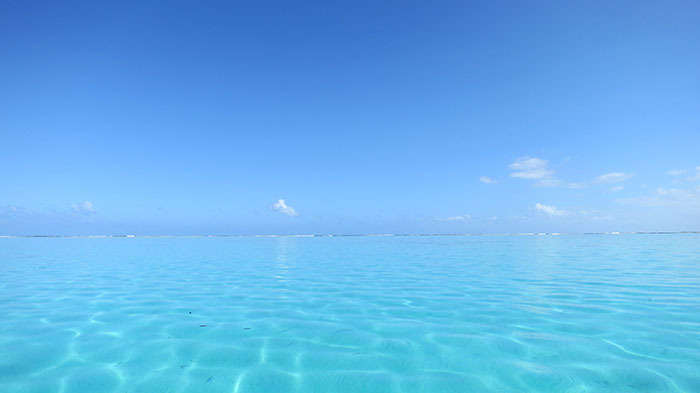 Two weeks in Tahiti, complete with it’s French romance, crystal clear waters, gorgeous sunsets and the love of my life has truly been a dream come true. 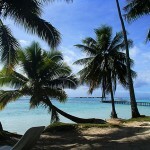 Being from Montreal Josi’s childhood dream was to one day visit the French tropical beaches of Tahiti. 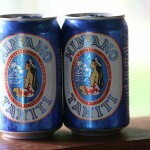 As a little kid I loved the soda pop called Tahiti Treat… Thus we chose Tahiti as our last stop of our around the world surfing/ honeymoon/ adventure. 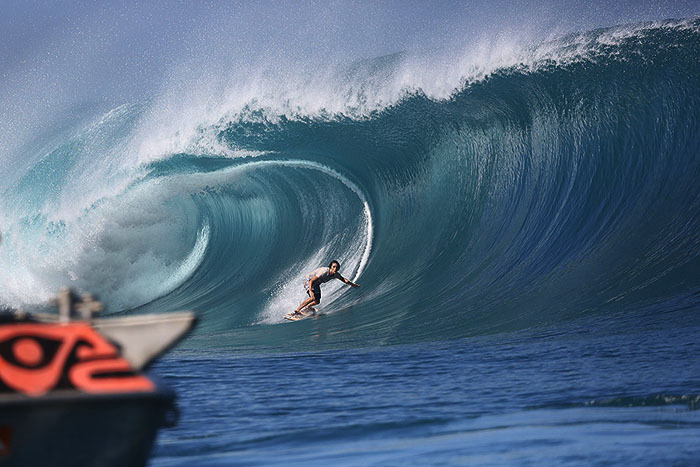 We knew the odds of Teahupoo breaking big when we were scheduled to be there were very slim and we decided well before hand that if it did we would do what ever it took to be there. 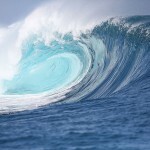 For those who don’t know, Teahupoo is a legendary big wave surfing spot in the South Pacific on the island of Tahiti. 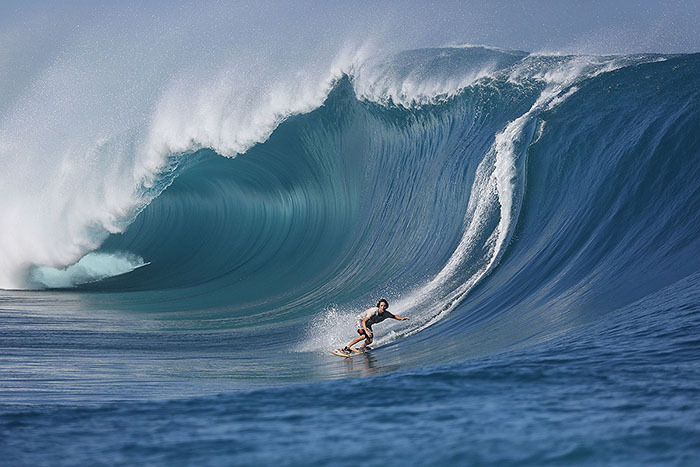 When it gets really big, it’s massive size and punishing thick lipped barrel are so fearsome that only a select few are crazy enough to risk their life’s in exchange for whatever it is that motivates them to ride it. Professional big wave surfers, dare devils and mad men follow the storm swells online and when the conditions are perfect they fly in from all over the world to brave it’s insane power. 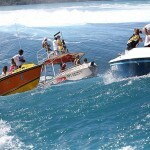 As fate would have it, a massive swell started brewing off the coast just after we arrived in Tahiti. 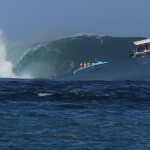 Everyone on the island was talking about the monster swell that was on it’s way and that pros are flying in to surf it. 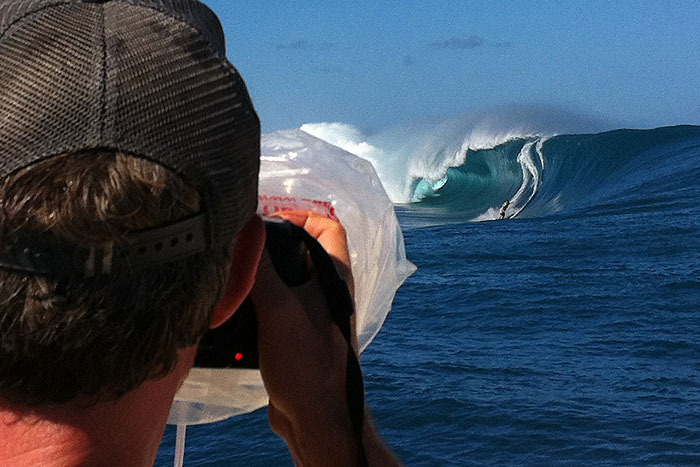 Josi and I watched it carefully online and when the the swell was about to peak we plotted our trip to Teahupoo. All of the boat companies who take surfers from the beach to the outer reef where it breaks had been fully booked for some time so we weren’t able to secure a water taxi to watch from up close. 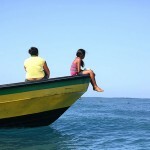 We had been told us to choose a water taxi carefully because on many occasions the less experienced fishermen who take people out to watch make the mistake of miscalculating the wave and quickly finding their way to the shallow reef below. We didn’t have a boat reserved, but we had faith that it would all work out so we went anyway. Thanks to a tip from our good friend Skip, we chose to stay on the island of Moorea close to a great left breaking wave called Haapiti. Teahupoo is on the Tahiti which is the island next to us so we had to get up at 5am to start our journey. I awoke with a mix of excitement and fear, which made no sense to me seeing that I was only a spectator and not on the field of play. Having lived action sports my whole life, on seldom occasion I too have played on the edge where one wrong move would prove to be my demise. You can do everything exactly right, making no mistakes at all and still, if mother nature decides otherwise, even the most flawless performance can find you at it’s mercy. Not to mention that human error can strike even in the most perfect and compassionate of conditions. With a quick cup of instant coffee we had our hosts Tama and Marie, from Moorea Surf Bed and Breakfast, drop us off at the ferry. 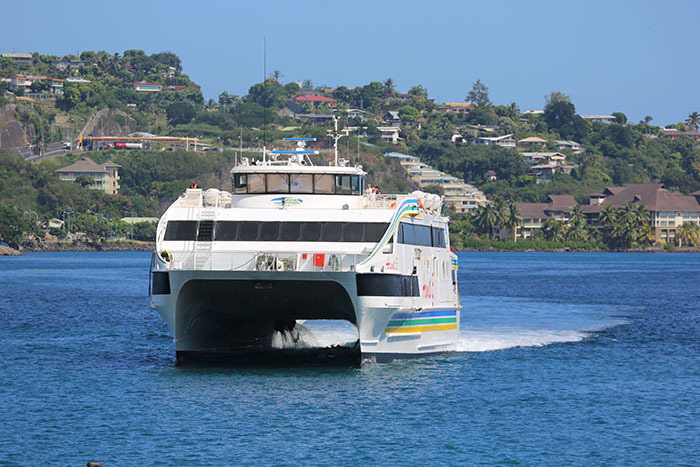 Our crossing in itself was exciting as our big catamaran navigated the massive swells. 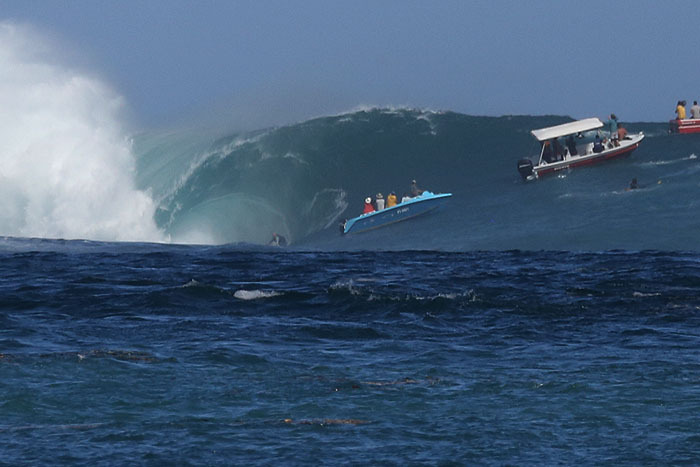 The boat handled the swell with ease while we all watched in awe as the massive waves rolled by one after the other. Once we got off the ferry we were picked up by our rental car company and taken to their office. In no time we packed into our tinny French car and high tailed it down the coast in search of this legendary wave. Along the way we came across countless fishermen who had set up road side stands where they proudly displayed their freshly caught tuna. 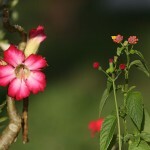 I’m not sure how long they would last hanging there in the tropical sun while waiting for someone to buy them? Regardless, it made for a interesting sight and we drove on with out stopping to take a photo. Mixed in with the palm trees and bright turquoise lagoons were endless poorly painted graffitis and tags that littered every brick and cement wall in sight. 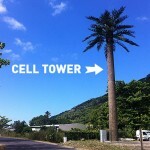 It’s such a shame that main stream culture can ruin such a tropical paradise. To me the real Tahiti is better found on it’s outer islands where life is slowed down and less effected by main stream culture. As we pulled into the parking lot at Teahupoo there was already a small crowd watching the waves breaking way out on the outer reef. You could see small boats crowded close to the wave bobbing up and down as the house sized swells rolled in. In the parking lot another surfer told that all of the boats were totally full and that they were only taking pro photographers out. I have my big camera on this trip so I was ready to pull the photographer card if needed. “International adventure photographer and blogger for the esteemed online publication Foxy and the Fox.” It sounds good, but I’m not too sure how it will fly? Regardless we had come too far not to see what magic we could work so we drove to the marina to find us a boat. The parking lot was abuzz with cars and people of all shapes and sizes, anxious to get out to watch the surf. The most professional looking boat operation that was there was taking people out for an hour at at time, but they were fully booked all day. Josi and I decided to split up and ask around to see what we could find. In short order I found a small man with a little boat who was open to taking us out in an hour. OK, that sounds pretty good I thought. Over the next few minutes I watched as he packed people into his boat to the point of being well overfull. I didn’t like the look of it, but I was stoked because I knew that we were going to get out. Luckily Josi did better than me and found a guy who was willing to take us out right away. $30 each for two hours. He looked like a bit of a drunk, but he didn’t smell of booze, his boat was big and clean and we were the only ones on it so we headed out. To our surprise he only took us as far as another smaller boat that was half full of surfers from Venezuela. Josi had second thoughts because of the size of the new boat. I was more worried that the captain and his first mate looked like pirates with missing teeth and all. They didn’t speak English and they barely spoke French, which made no sense, but by this time we were committed. The difference between watching surfers at Teahupoo vs Jaws or Pipeline, is that at Teahupoo the spectators are also the participants, each playing their own game of roulette. 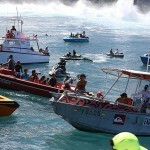 There were about 12 boats sitting abstractly close to the breaking wave, each packed with jubilant spectators. There was also a number of support crew for the surfers on high powered jet skis, along with several spectators sitting on surfboards. At one point there was even a helicopter filming the action. Time all but stopped when we saw the first guy get toed into the massive wave. The jet ski powered up when the wave was only a bump and like a wake boarder the surfer popped up behind and was pulled into the wave. He looked Hawaiian with long curly hair and a friendly face and he pulled hard away from the jet ski, down the face of the wave rocketing toward us. The growing wave rose from the depths of the sea quickly becoming a mountain of water. In contrast, the surfer started a mountain of a man and quickly became a speck of sand holding on for a greater glory. Like those who have full mastery of their trade, he made it look so easy as he surfed his way down the vertical wall of the wave. After making the drop he seemed to find a place of inner peace and as the massive barrel threw over him he waved to the crowd as if to say this was just another day. As the wave roared by, he disappeared into the barrel and the crowd awaited in anticipation to see if he would make it out. As the final breath of the wave was squished out of the hollow wave, so to was the surfer, still with his hand in the air. The crowd was in awe as they cheered and his dark Polynesian face beamed with happiness. The second he was off the wave his trusty partner on the jet ski was there to pick him up and in no time he was being toed back to catch another. 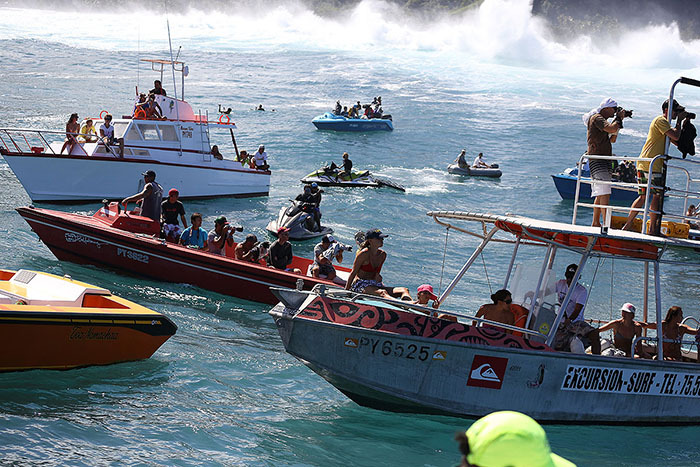 The viewing boats dance back and forth rallying for the best position to watch the surfers before the wave closes out on the reef. On more than one occasion, the massive sets would shift to the right and like a school of small fish fleeing from it’s prey, the boats would find themselves racing up and away from the oncoming waves. 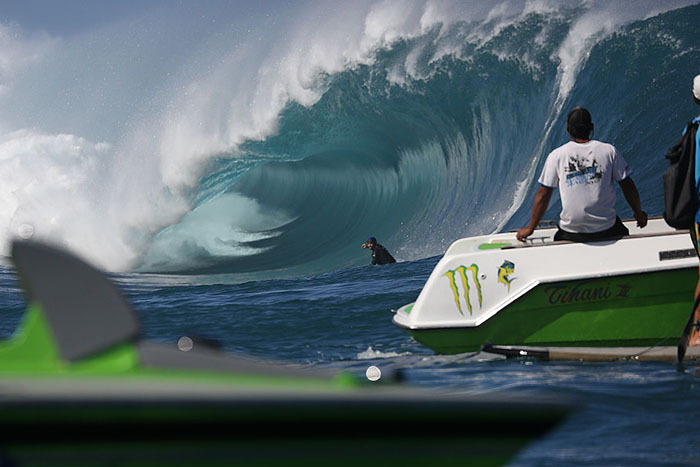 When the big sets come in, the boats make a run for it and in that moment everything is pure chaos. On one occasion our boat was one of three deepest in the pocket when the biggest set of the day rolled in. The inner workings of the barrel was so big that you could build a house inside of it. I whistled to let our captain know something was coming, as he seemed more interested in the surfer than his crew. The moment he saw what I saw he put on the gas and we climbed up the steep face of the hugest wave I have ever seen. I was busy holding on with one hand while still taking photos of the boats below with the other. By the time we crested the peak, the bottom boat had long fell out of sight and must have been 30 feet below us. This boat and another were always the two deepest as they were full of professional photographers who were capturing both stills and videos. Their captains were either the best boat drivers in the world, or they were getting paid so much that they were willing to risk everything to get the shot. Perhaps it was both? 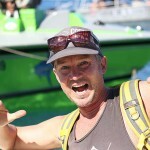 I was positive that the last boat wasn’t going to make it up the wave because in my eyes we barely made it. At the last second they came vertical through the top of the lip just in the nick of time. I didn’t take the video as I was only shooting stills, but in the video below you can see footage of the boat in question. There were about 8 teams of surfers, surfer and jet ski driver, and each was as amazing to watch as the other. As one fearless surfer dropped in we could tell that he was too far back to make the section. Thanks to the help of a life jacket he finally surfaced with enough time to take a deep breath as yet another even bigger wave came down on top him. This time he didn’t come up as quickly and his partner on the jet ski raced back and forth looking for him in the white wash. At one point the jet ski driver turned to the crowd to see if any of us had spotted him. We had a much better vantage because with each wave that rolled in, we were raised up so that we could look down over a much larger area. When he finally popped up he was about 70 meters away from where he started. Within seconds the jet ski was there and the driver strong armed the surfer onto the back of the ski, jetting off seconds before another huge wave took them both. The guys on the jet skis don’t get the cover shots or the fame, but they are indeed equally as fearless and brave as the ones ridding the waves. With out them there is no way that half of these guys would still be alive. When we made it back to the wharf both Josi and I were in awe of what we had just witnessed and our hearts were still racing. We sat on the beach eating a small picnic and watching from distance as the surf continued to roll in on the outer reef. 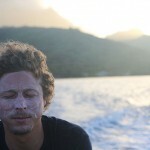 I could have watched for days but we needed to catch the ferry back to Moorea so we drove off with huge smiles on our face and a memory that will last a lifetime. If you are ever in Tahiti and the buoy readings hit the 20+ foot mark with a good swell period be sure to check out Teahupoo. I promise it’s something that you will never forget. Here is a video that was shot by one of the photographers on the same day as we were there.